So you’re getting ready to launch your new venture. That’s great! This is an exhilarating time. I’ve been there hundreds of times with my own companies and with my clients’ companies. I’ve lived in this exact space for my entire career. One thing I’ve seen over and over is enthusiastic, new entrepreneurs who want to get their business launched ASAP. They’re on a mission to get live. That’s the spirit but whoah, let’s take a step back for a minute, grasshopper. You will have to live with the decisions you are making with your company’s brand for years to come. A properly designed logo, name, and clear message lend to your credibility. Credibility is an essential ingredient when building trust, and if you know anything about selling, you know that sales don’t happen without trust. If you miss the mark, it WILL affect your level of success. 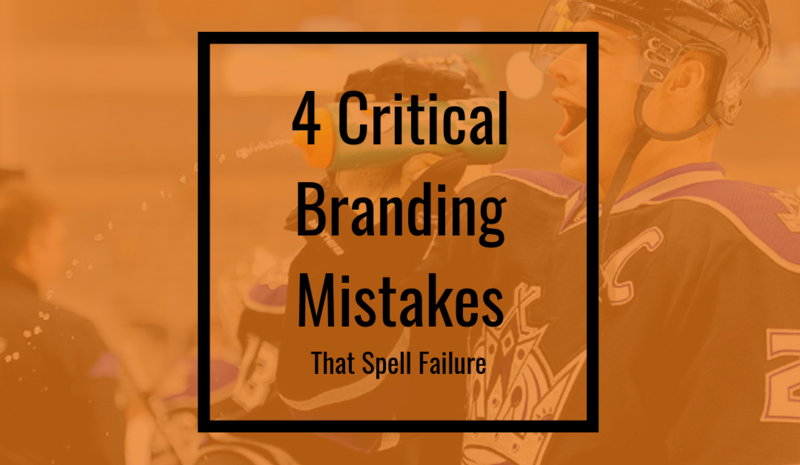 If you can push hard enough to overcome a miss with your brand, you will eventually have to invest in fixing it. Let’s make sure you nail this right out of the gate so you can achieve maximum results. A successful brand creation starts with research. This is the most important step in creating a brand that impacts your target audience. This is also the most overlooked step in the process. New entrepreneurs tend to want something that sounds cool or looks cool to THEM, but in most cases is based on nothing more than just that. Although it may look cool to you, ask yourself, are you your target market? If not, who is? What do they tend to gravitate toward? Is your customer health conscious? Or on a mission to save the environment? How old are they? What is their demeanor? Are they attracted to loud aggressive brands or more grassroots brands? Without laying the groundwork, your designer has nothing to go on. One of our clients was getting ready to launch a brand new tattoo aftercare product. When they came to us, they were adamant that they wanted a tattoo gun in their logo. They had made some sketches of the ideas they had that included the gun. Their intricate design sketch was going to make an incredible logo! But to the trained eye, this logo was too busy. Once it was shrunk down to a small enough size to go onto a product label (we call this the dime test), it would be unreadable. Dime Test: Shrink your logo small enough to go on a product label (or even a dime). Is it intelligible? Since we had already established trust, I asked my client if they would be open to seeing other options. “We will design three options using a tattoo gun and three options with what our team feels will be a better fit.” They agreed to trust our process. We presented our designs at a restaurant. As a test, we approached three tables and asked which one they liked best. The designs were label size. The results: All three tables of people could not make out what the tattoo gun was in the designs. “Is that a crow?” one guy asked. Our research told us that we should have more of a clean, environmentally friendly, vegan-friendly, medical feel for the consumer. It was equally important to use the color black, as all trusted products in the tattoo industry were black. Choosing the right color would impact shop owners more and give the logo a tattoo industry credible feel. We also sent the product to several tattoo artists to use and critique. Your name should leave a lasting impression. At the same time, in my experience, there should be no doubt left in the mind of the person who sees it, about what you do. These names all have perfect clarity. If you don’t have millions of dollars to run marketing campaigns that teach about what your brand is, (I.E., Nike – “Just do it.”) then it will be extremely important that your name leaves zero doubt in the minds of your target audience. What does your business or product do? Who does it help? What is keeping those people up at night? Why? When creating a message its not about your company. It’s about your customer. They are not coming to your website or Amazon store to read about your business or the history of your product. They are looking for information on how it will solve their problem. This is all about positioning. In order to position your message, you will need to identify two things first. 1. Where they are before your product or service? 2. Where they will be after your product or service? Example: Karate kid was being bullied at school daily. He had a problem, he didn’t know how to defend himself. Then he met Mr. Miyagi. Mr. Miyagi taught him Karate and he not only got the bullies to back off, but he also won the largest karate tournament AND got the girl. You don’t want to be Karate, You want to be Mr. Miyagi. Position your brand as the guide in the story. Your customer is the hero. Therefore, all of your ads and copy on your website should be about them. You stay in the background catching flies with chopsticks. So there you have it. If you can hit the mark with your research, logo, name, and message you will have a solid brand strategy that will pay for itself over and over again for years to come. If you speed through the process to get rolling, you will have an instant hurdle to overcome. In the end, it will have to be fixed, but doing it correctly is a choice you will have to make. If you would like to discuss how you can develop a compelling brand right out of the gate, we invite you to schedule a 30-minute marketing growth call with one of our brand strategists. The call is free of charge and gives you access to a professional who can get you started in the right direction.